The 10-day Family Re-charge starts today. Wondering what on earth that has to do with remodeling a house? Because a house is only a reflection of what is happening in the lives and hearts of those who dwell inside. And for now, in our state as a new family of four, all house projects are on hold and we are simply doing what it takes to refill the well. Our project haus just gets to wait. 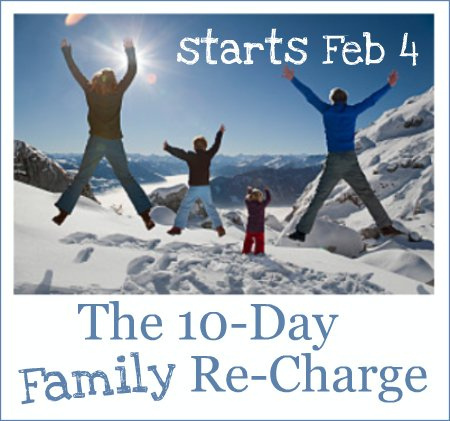 What inspired you to join the 10-Day Family Re-Charge? In 2008, my husband and I did a 10 day silent meditation retreat in Thailand that significantly altered the course of our marriage and individual lives. You can read about it here. Every February since, I have reflected back on that time and used it to re-align whatever felt out of balance. This year - we are in a newly purchased house and have a brand new baby and a fire ball of a toddler. What inspired me to join this recharge? Well, basically, it's a structure to help us regain our equilibrium. What are your goals (personally and as family)? For these 10 days, turn off all movie and internet browsing, except the FB and email format needed for this recharge. For these 10 days, prioritize eating, cooking, snacking and all food planning. For these 10 days, sit on my meditation pillow 10 minutes a day. For these 10 days, practice 10 minutes of yoga/movement a day. By December 2012, my pre-baby #1 clothes fit again. What’s working well in your family right now? Consistency in parenting our toddler. Asking for help and allowing it to happen. Not over scheduling or overcommitting. Where are some places that you’d like things to flow more smoothly? Oh, and getting back to a meditation practice. How are you doing with healthy eating and shared meals? Doing great with shared, family meals. Its the food prep and actually eating that needs our attention. Are you enjoying regular joyful physical movement (a.k.a. exercise)? How are you doing with managing “screen time”? Good - We don't own a TV so that helps immensely. But when baby is crying and mama is tired and a certain toddler wants to watch Nemo..well, you know the answer. However the iPhone is challenging me. My husband's use of the iPhone is challenging me to be more accurate. Are you getting enough rest / sleep / downtime? No, but for a 5 week old, he could be causing way more havoc than he is. What is your family most needing right now? A plan around food buying, prep, cooking and eating.